Eve is a pretty great idea. Traditional irrigation systems stick to a steady schedule and water your lawn for the same amount of time every week (whether the grass needs it or not). Some advanced systems have rain sensors that can help limit watering if Mother Nature is lending a hand. Eve steps it up...a lot. 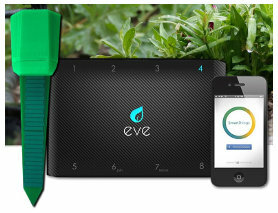 Eve still works like a traditional irrigation controller. In fact, it can be wired in place of your current controller with little fanfare. The evolutionary part of the system is the Adam moisture sensor. These moisture sensors are pushed into the ground in various places around the yard. Each sensor contains a thermometer and a two-level moisture sensor. It senses moisture on the surface as well as down at the root level. This information is sent back to the Eve controller wirelessly via a Zigbee module which should transmit to at least 300ft. The system connects to the Internet so that, in addition to the moisture sensors data, it can use weather forecasts to help decide when and if it should water. An app is available for smartphones and tablets that allows configuration and control of the system. In addition, it's designed to work with SmartThings (a SmartThings hub is required) so that it can become an integrated part of your home automation system.